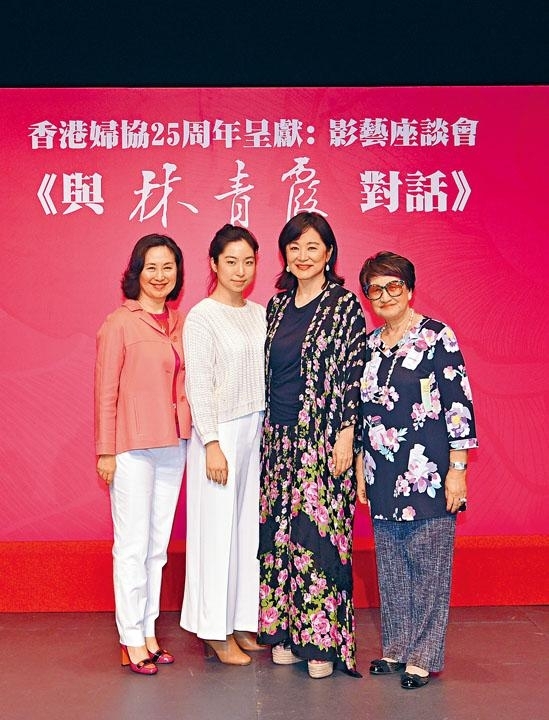 The Hong Kong Federation of Women organized film forum A CONVERSATION WITH BRIGITTE LIN took place yesterday in Wanchai. 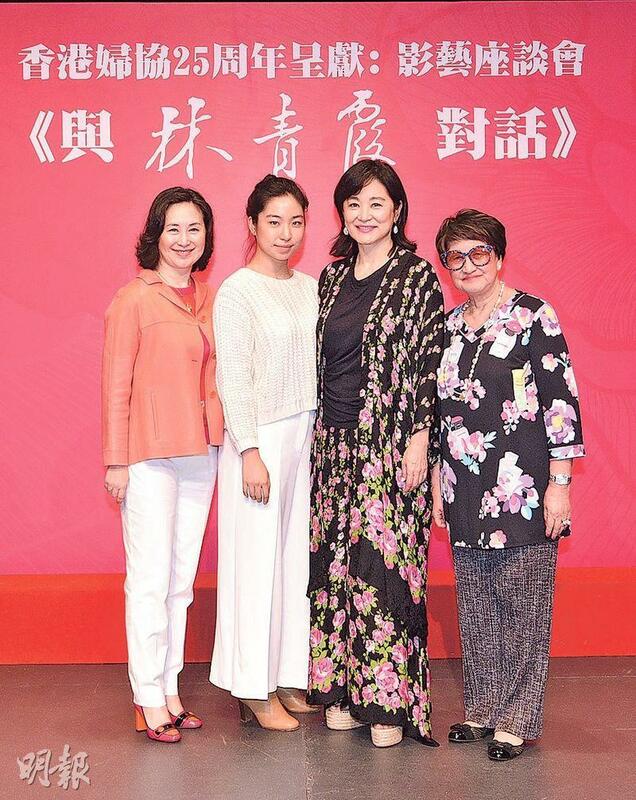 Brigitte Lin (Lam Ching Ha) shared her years of film industry experience. First time host Pansy Ho Chiu King had nothing but praised for Ching Ha and joked that sometimes she wanted to make a movie too. Ching Ha said that her business was enormous and she did not need to make a movie, which cracked up the entire crowd. Lam Ching Ha's daughter Ying Oi Lam was in the audience in support of Mommy. The forum's host was HKFW chair Ho Chiu King. She said that she was nervous about her first hosting gig and that she put a lot of effort before she was able to talk Lam Ching Ha into the event. She hoped through her film industry achievements to encourage even more young people to join the cultural and creative industries. Lam Ching Ha was discovered on the streets of Taiwan by a star scout at age 17. After her first film BEHIND THE WINDOW she became an overnight sensation and had endless film offers. With zero acting experience, Lam Ching Ha kept working hard for her love of film. Her family finally recognized her passion and supported her film industry development. Ho Chiu King deeply agreed and said that her sister Josie Ho Chiu Yi as a teenager already wanted to work in show business. At the time her family all objected, but with Chiu Yi's determination and passion she moved her sister Chiu King. She helped convinced their father Stanley Ho Hung Sun. Thus she felt that when young people chase their dreams, family support is also very important. Lam Ching Ha suggested to dream chasing young people to have decent ability to fight stress. She mentioned that one day she asked her daughter Oi Lam, what would she want to say to young people who were preparing to join the society and work? Oi Lam told her to tell them not to be discouraged when they fail. This woke her up to the importance of Adversity Quotient. Ching Ha said, "Don't let failure ruin you, you have to have the ability to overcome setbacks and turn it into the chance for success next time. You have to turn the tripping stone into a stepping stone, the change in thinking is very important." Lam Ching Ha in 1984 came to Hong Kong for her first film THE OTHER SIDE OF GENTLEMAN (GWUN JI HO KAU). Her best known role had to be Invincible Asia. Having always made romantic films, Ching Ha's transition to martial art action film required time to adjust. She even revealed that because of playing Invisible Asia she almost drowned. She said, "Once I had to make a scene in which Invincible Asia emerged from the water. The appearance looked very heroic. Because I was in the water for a long time already, when I learned that I had to keep shooting the next day I reminded myself to go to bed early. That night I got a call from director Yonfan to invite me to play mahjong. Originally I turned him down, but he said that John Lone would be there too. I said I would play 4 rounds. We ended up playing until 6AM. At the time I thought, I definitely wouldn't have the energy to work. When I got to the set I waited, when the sun was about to set the director finally asked me to get into the water. When the equipment was in place I got in. Everyone saw how frustrated I looked, actually at the time my hair was caught in a machine. I almost thought that I would drown and die. Luckily it was only a wig. The director however asked me to keep going. I could only use my real hair. When I saw that scene later, I realized that it was my most beautiful shot in the film." Ho Chiu King heard Ching Ha's experience and joked that she sometimes wanted to make movies too. Ching Ha told her, "Your business is enormous, you don't need to make movies." The crowded cracked up. Speaking of Ching Ha at the peak of her career retiring to start a family, having two cute daughters and a happy family, Ching Ha added that she also had a step daughter Ying Ka Sin she loved very much. She revealed that in a few days she would give birth to her second daughter and making her a grandmother again. The audience applauded to congratulate her. Ching Ha also mentioned that Oi Lam was a kind hearted child and inspired her a lot. She said that the power of love exceeded everything and everyone should cherish it.